Special thanks to Wake Up 2day for a fun morning on KHON-2. …and Enjoy a Wide Variety of Delicious Foods AND LOSE WEIGHT While You are Having the Time of Your Life. - Lose Up to 5 pounds in 3-Days with The Party Girl Diet’s HEALTHY Kickstart Plan! 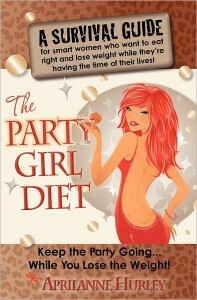 - Burn Fat & Calories with The Party Girl Diet’s Cutting Edge Workout Guide ~ No Gym Required. Look no further – Hurley’s Party Girl Diet is a healthy, sustainable lifestyle, and a must read for anyone looking to achieve a new level of health, beauty, and fitness.~ Vic A. Narurkar, MD. , Chief of Dermatology, California Pacific Medical Center, SF, Founder of the Bay Area Laser Institute, San Francisco, CA. “I’ve read them all and this one is terrific. I was so inspired after reading this book that I changed my whole way of eating…my fridge looks like a rainbow and I have ditched the low carb mentality.” Maria K.
“The Party Girl Diet not only became a self-help book for me on so many different levels, it is an information bank of healthy ‘lifestyle’ tips, recipes, scientific formulas for fitness, nutrition and fun!! “~ Maureen T.
Order The Party Girl Diet on Amazon and get FREE 2-Day Shipping with Your Amazon Prime Account! Dishing food, fun & fitness straight up with a twist. Aprilanne Hurley SFN, CLFC, is a Certified Specialist in Fitness Nutrition, Certified Lifestyle Fitness Coach and author of The Party Girl Diet™ book series available on Amazon.com. 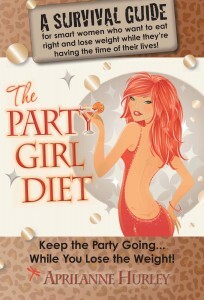 To arrange a media interview please contact Party Girl Diet author Aprilanne Hurley directly by phone @ 415.209.0722.